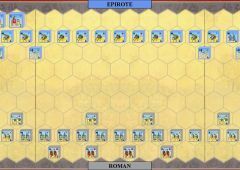 Pyrrhus of Epirus nearly doubled the size of his army after his victory at Heraclea with allied Greeks, Samnites and Lucanians flocking to his standard. 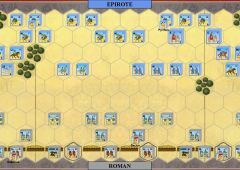 After absorbing the new recruits, Pyrrhus set off towards Rome. 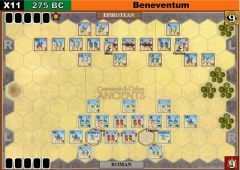 His advance was stopped at Asculum by the two Roman Consuls Decius and Sulpicius, with four legions and allies. 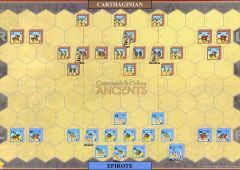 Both sides had around 40,000 men, but Pyrrhus had the advantage in cavalry and, of course, his elephants. After a day of skirmishing in rough terrain, the two armies lined up at daybreak on level ground. 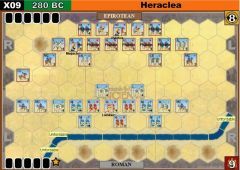 What followed was a straightforward Legion versus Phalanx battle. 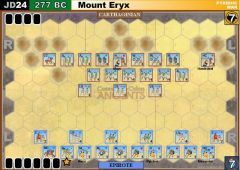 During the battle Pyrrhus failed to envelope the flanks. 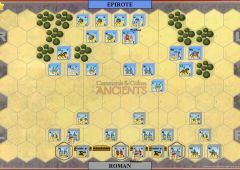 After a hard fight in the center, the Romans were driven back once again by his elephants. 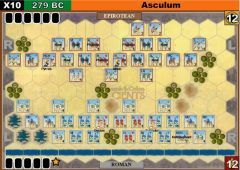 Pyrrhus was at the forefront of the fighting and was wounded, preventing him from exploiting his victory as the Romans fell back to their camp. At this point in history it would seem that the legion was no match for a well-led Macedonian phalanx style force. Over 6,000 Romans had been slain, but Pyrrhus had lost 3,500 of his men, mostly irreplaceable veterans and many of his officers. 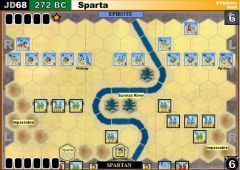 Pyrrhus reportedly exclaimed after the battle “One more such victory and I shall be lost!” giving rise to the term, a “Pyrrhic Victory.” The path to Rome was still guarded by other armies, and the Romans refused to negotiate a peace treaty as long as the Epirote army remained in Italy. 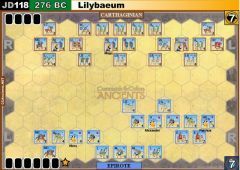 Discouraged, Pyrrhus accepted an offer from Syracuse to lead the Sicilian Greeks in their war with Carthage in 278 BC. 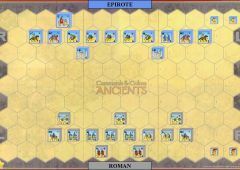 Each side must place three leader blocks on the battlefield after each Overall Commander has reviewed his Command cards. 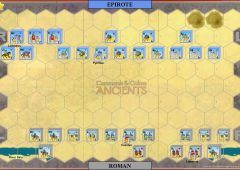 The Roman player places his leaders first than the Epirote player.